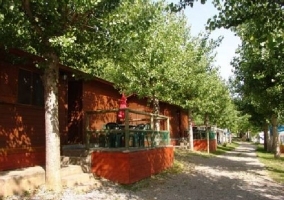 This accommodation is a bungalow attached to another, completely built in wood y with a rustic style, has a maximum capacity for 2 people , his stays are distributed in a single bedroom , a kitchen completa, a bathroom y a space with living room and dining area. The bathroom is private and complete, has shower with hot water and towels. The kitchen completely equipped with refrigerator, stove and all necessary household items. The living room and the dining area share the same space, has a sofa bed and an area with table and chairs. 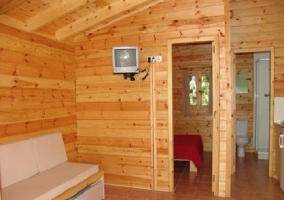 It is a very bright and spacious room, with views of nature. 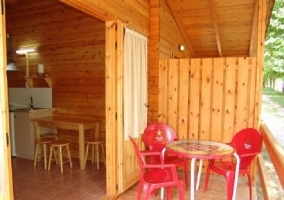 It has a spacious porch with outdoor furniture perfect for enjoying outdoor mummies enjoying the mountain views. This accommodation is a bungalow that is situated surrounded by nature, large trees and next to a river. There are wooden and stone bungalows according to the nature of the area. 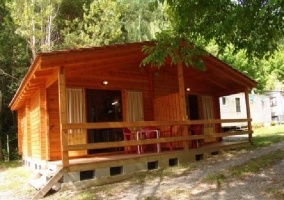 It has a maximum capacity for 4 people, has 2 bedrooms, and a fully equipped kitchen, a complete bathroom and common areas such as the living and dining room , plus a large porch. The p rimer bedroom has double bed , follows the rustic decoration of the whole house, with storage space y with nice al views outside. The second bedroom has a bunk to host 2 more people, has window overlooking the nature and storage space. The bathroom is complete and with shower, it is a spacious and functional space. With hot water and towels. The kitchen is fully equipped, with all the appliances necessary and all the kitchen , is an open and illuminated space. The living room with a comfortable sofa comparte the space with the dining area formed by a large wooden table and chairs. The porch is a large space with garden furniture perfect to enjoy the outdoors and its views. 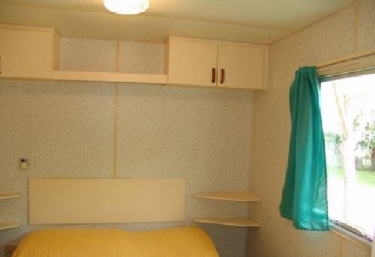 This accommodation is a mobile home , occupies a parking space and has a garden area with outdoor furniture. 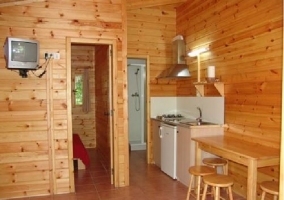 It has a maximum capacity of 4 people , with 2 bedrooms , with a full bathroom, kitchen and a large living and dining area. The first bedroom has double bed, a lot of storage space, a window with exterior views and bedding. The second bedroom has 2 single beds , with a lot light and storage space.With towels and sheets for guests. The bathroom is complete and with shower , it is a room , with towels and toilet accessories available to guests. La fully equipped kitchen , with all electrodometers and kitchen necesarios. The living and dining room are a very large open space , it has a large sofa and a table to eat, it has air conditioning and a lot of lighting thanks to the windows overlooking the exterior. The garden area is perfect to enjoy and relax moments to go free while you admire and breathe the tranquility of nature.